I’m going to have to stop apologising for not updating this blog. We’ve been doing lots of boring, unphotogenic, slog repetitive stuff. Filling holes, mostly. 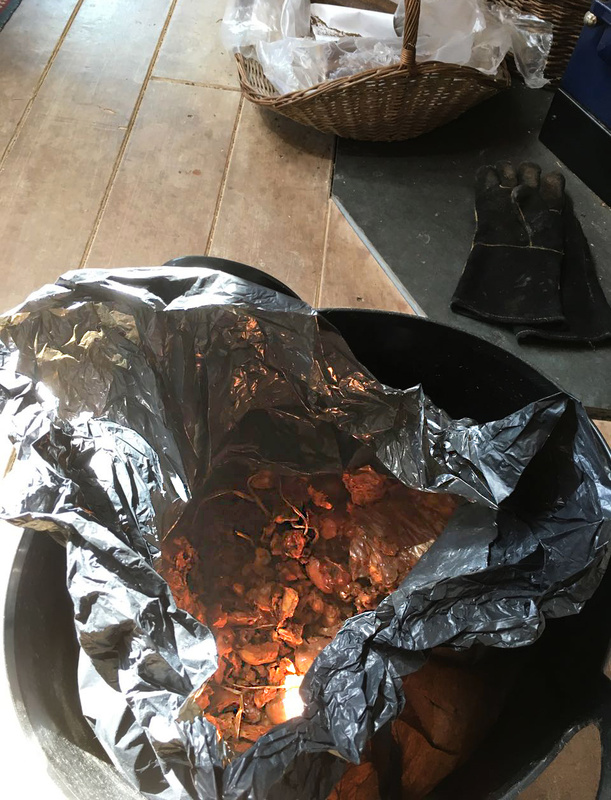 But this week, warmest this year, we’ve been doing some new style cooking – getting ready for our future! My next cheese is going to be in the style of an Epoisse – a cheese that is washed in Marc – a grape pomace brandy. 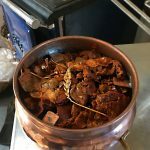 I thought it might be fun to make my own wash for my cheeses by making pomace brandy out of apple pomace. Luckily we have friends who press their apples to make apple juice and cider. Last November I collected their Pomace from them. 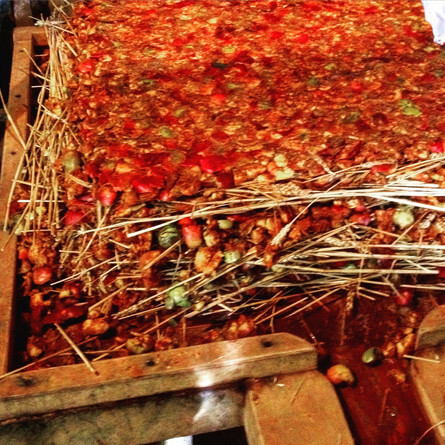 According to tradition you press the pomace tightly for a few months and it will ferment naturally – then you distill it. Yesterday (yes a few months late!) I opened one of my pomace baskets and the smell was gorgeous. Definitely a bit alcoholic and very apple’y. Not a whiff of vinegar. Very Pleased! But before I launched into this I had to clean out my Alembic Still. 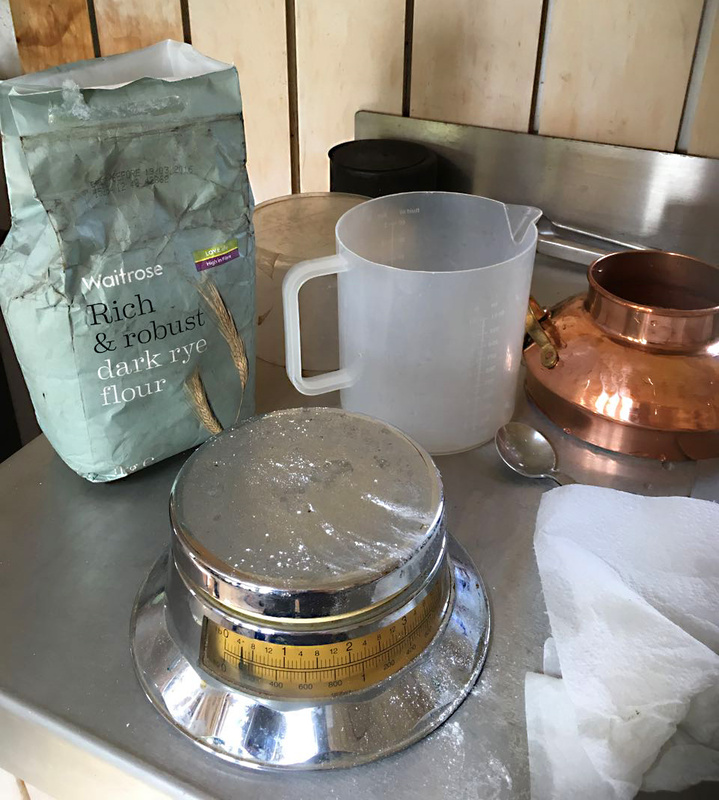 You mix rye flour with water, then distill this mix. 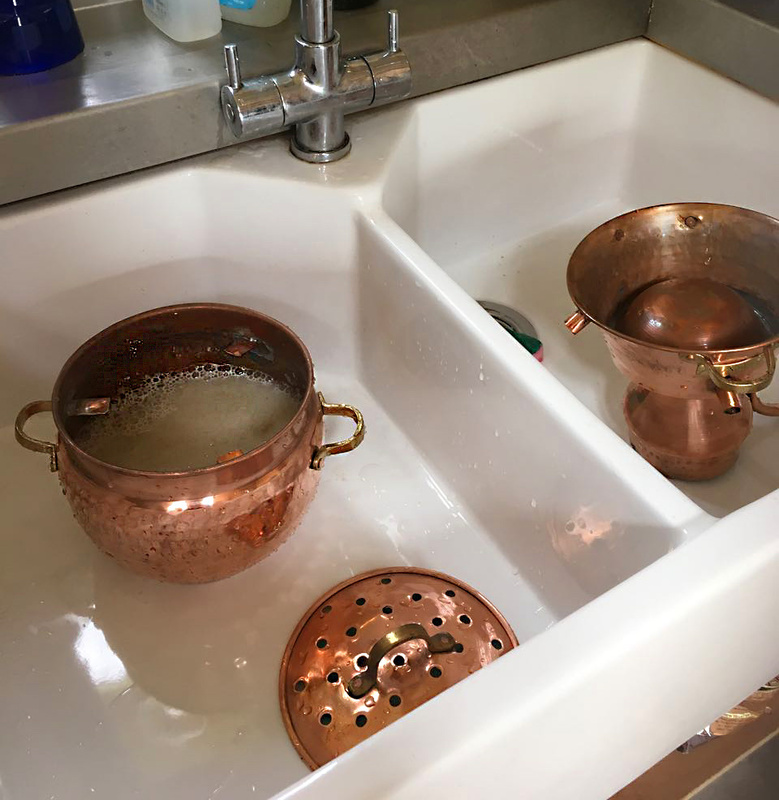 Before I did this the inside of the still smelled distinctly coppery. Afterwards it smelled completely neutral. Success! After the first rye distillation I filled the Alembic with the apple pomace. 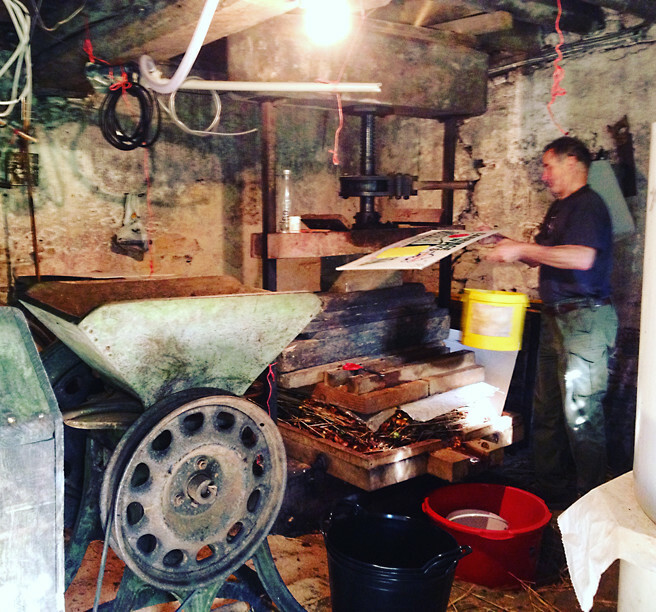 When Roland presses his cider apples he layers them with rye straw. 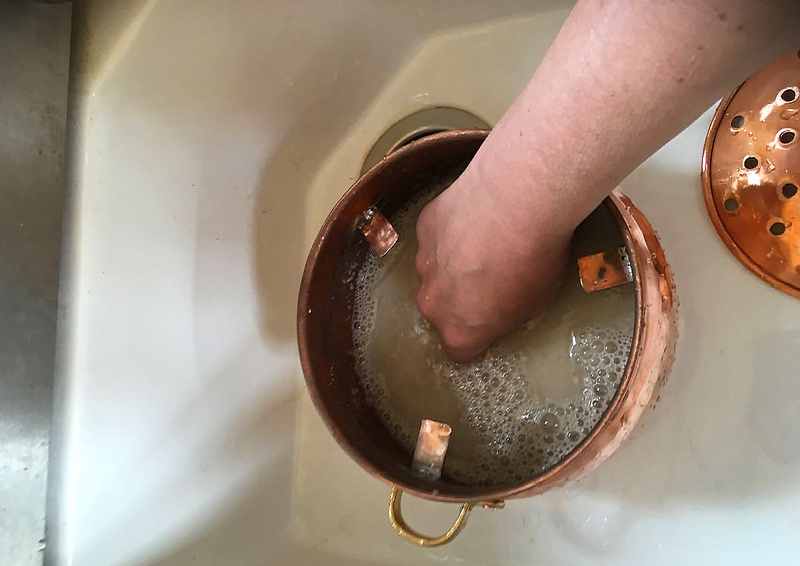 His press is nearly 200 years old and originally had some wooden slats that acted as spacers, but they’ve biodegraded and the straw was his clever solution to replacing them. 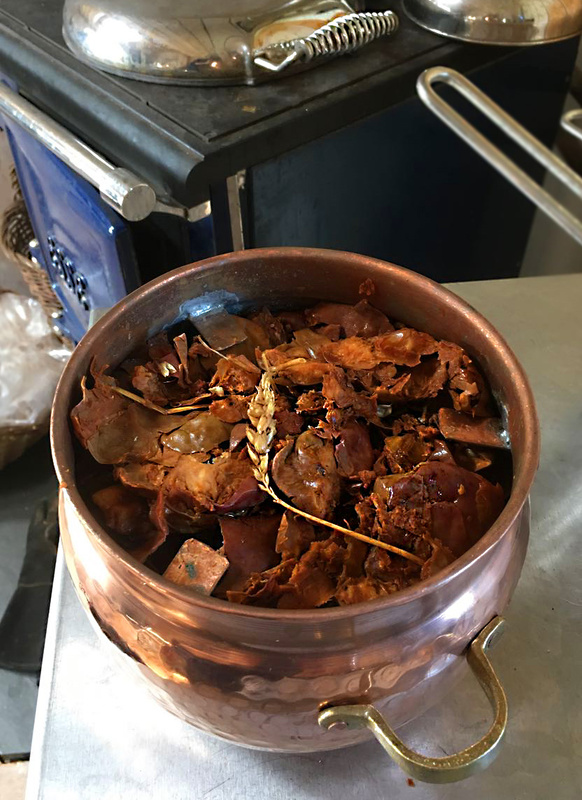 There were still a few bits of rye straw left in my pomace so I decided to put them through the distillation process. They use rye in whisky, so why not? Apple whisky/brandy – stage 1! 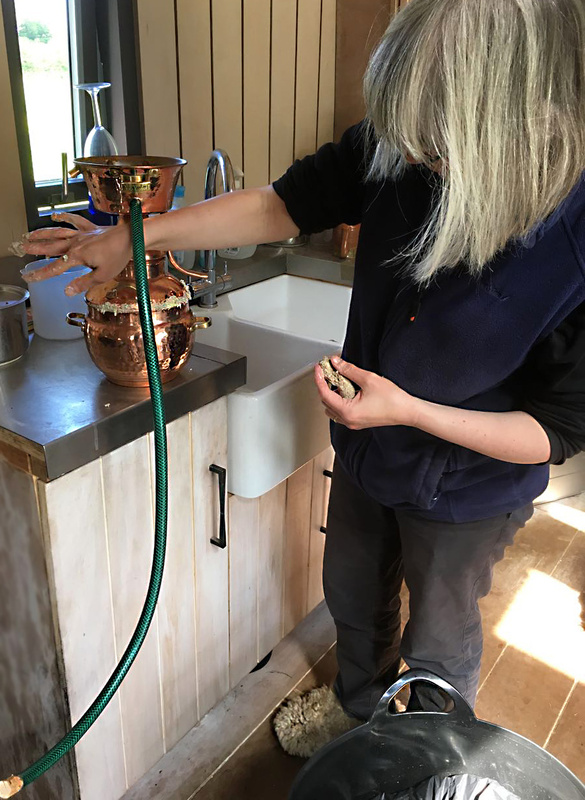 The garden hose is to circulate cool water around the top of the still. 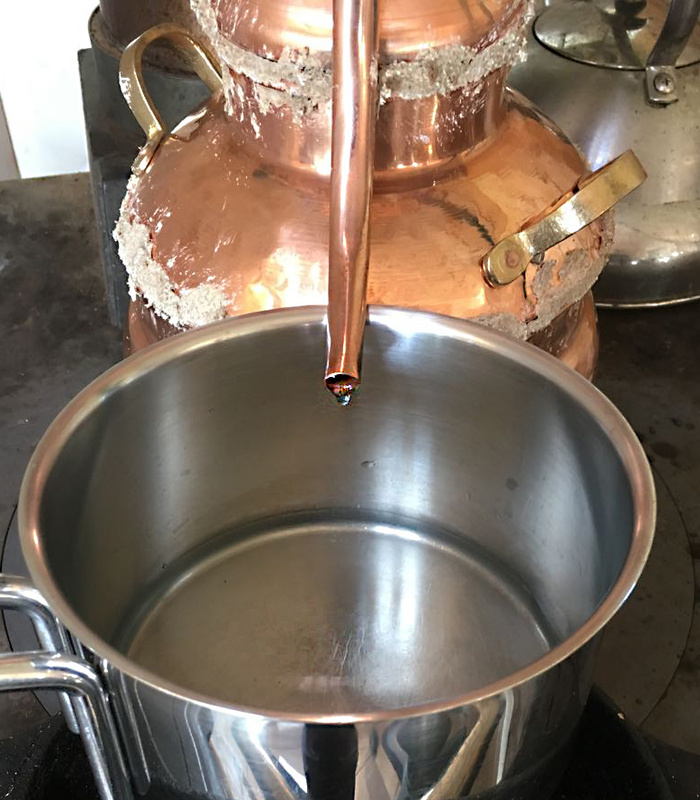 The water that goes over the top doesn’t ever come into contact with the distillate. The cup shaped bit has a dome inside which houses the condenser coil. As the stuff in the bottom boils up, its steam goes into this condenser coil. The cooler water in the top cools the vapour in the coil causing it to condense into the distillate. Which it did! This was the ‘first run’. I need to do this 3 more times, then take the accumulated first runs and distill them together. That ‘second run’ should be the final product. I’m a bit worried because the ‘second run’ will contain Methanol which is toxic. You are supposed to throw away the first 70 ml or so of the second run, but I would prefer to have a test, some kind of double check so I can be more precise! It is supposed to taste bitter and disgusting so that will help discriminate. As extra assurance I Googled ‘how to test for methanol’ and found two youtube videos. The first said that you dip a spoon in your moonshine and then light it with a match. If it burns yellow it is ethanol if it burns blue it is the dreaded methanol. Unfortunately the second video said exactly the opposite. Oh dear. More new style cooking at Easterdown. 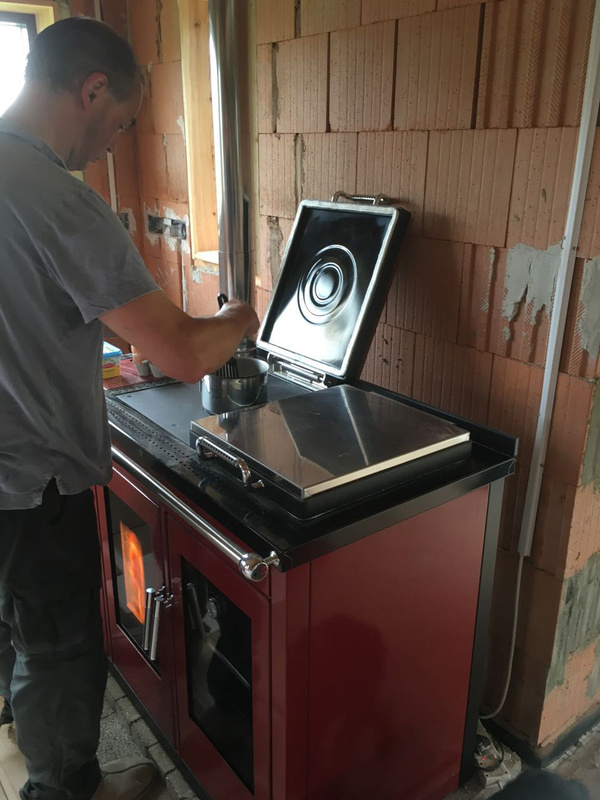 It is so warm right now that we really don’t want to light the Esse, so we decided to do our first cooking on Ruby the wood pellet boiler cooker this morning! 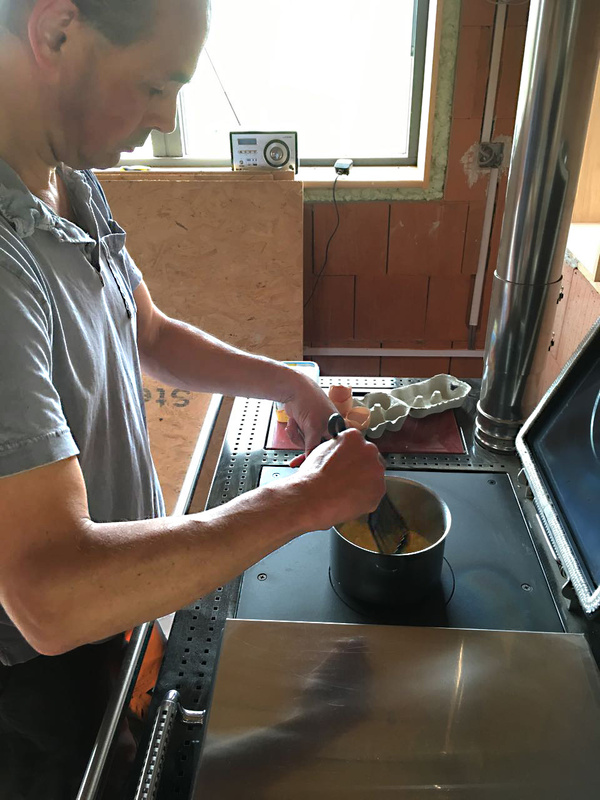 When we light the Esse it takes 45 minutes to an hour to get hot enough on top to do any cooking. But Ruby was hot enough to cook scrambled egg in about 15 minutes! Luxury!